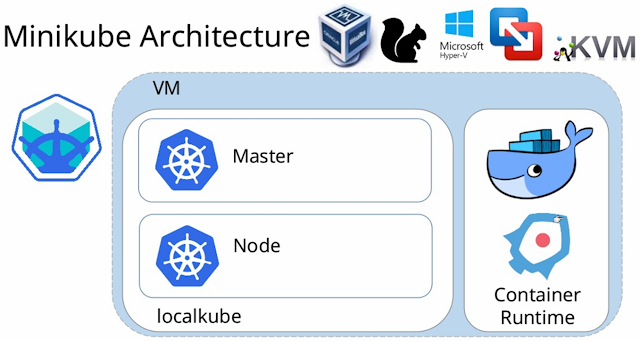 Kubernetes (aka K8s) is an open source system (from Google) for managing containerized applications across multiple hosts; providing basic mechanisms for deployment, maintenance, and scaling of applications. Minikube is a tool that makes it easy to run Kubernetes locally on your laptop/desktop. Minikube runs a single-node K8s cluster inside a VM on your laptop for users looking to try out K8s or develop with it day-to-day. Minikube for K8s is a popular method to get your hands dirty learning K8s. And a lot of K8s examples use LoadBalancer to teach how you can expose a service to the external world with k8s. Exposing an External IP Address to Access an Application in a Cluster is one such tutorial. This tutorial however clearly states that you need a cloud environment to work on this tutorial. Minikube doesn't come bundled with a LoadBalancer. So LoadBalancer services run fine with Minikube but with no real external-load balancer being created. Should you want to access your application services via this load balancer service, you are kind of lost without an external-ip isn't? After all, the application services are internal services having only cluster level visibility. Not happy with the work around and want real meat in your dev-box as well? Then go about trying LoadBalancer emulation using the $ minikube tunnel command; see k8s docs for more on this. Note: This external-ip that was patched was derived from the output of running $ minikube ip command. Or the cleanest approach possibly is to install a LoadBalancer in your local cluster - you may try MetalLB for this. How do I identify bad apples (companies)?